A recent find for a reasonable price in a second hand bookshop – The Wham! 1967 annual. I imagine this would have appeared on many a wish list drawn up in the winter months of 1966. This annual came out before I was born – so even though I am an annual obsessive I didn’t know very much about Wham! until now. 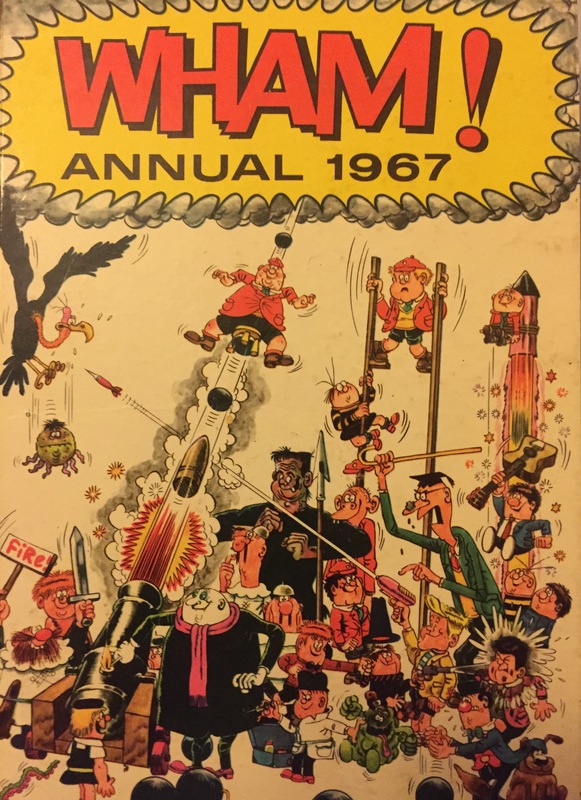 The comic launched in 1964 and it ran for four years, and one of the people behind it was Leo Baxendale, the legendary Beano artist who in the 1950s created The Bash Street Kids. Baxendale’s stamp runs through the 1967 Wham! annual very much; the cover alone you will agree is a joy. Reading it now, Wham! comes across as a freer, weirder, lost alternative to The Beano. Strips include The Tiddlers, a school story clearly in the vein of The Bash Street Kids and The Wacks, twins not dissimilar to Dennis the Menace with a very 60s flavour to their adventures, when their “super-charged” record player goes out of control and launches a set of beat records that run amok. A stand out strip is Frankie Stein, a humourous horror character who following monetary problems is forced to rent out his home Mildew Manor to a group of modern artists. The strain they put on him leads him to visit a psychiatrist called Doctor Von Schnoogle and he later clashes with a character called Gideon Ghoul who has similar anxieties. Best of all is the Baxendale drawn and quite surreal Eagle, Eye Junior Spy where the baddie Grimly Feendish is thwarted in his attempt to engulf London in sleeping gas and rule England. It’s switched to laughing gas without him knowing it, although with no sense of humour this doesn’t affect him. Frankie Stein survived into several later comics, including Shiver and Shake and Monster Fun Comic which I can remember from the mid 1970s. Grimly Feendish, who looks a little like Uncle Fester from The Addams Family, also appeared in other comics after the demise of Wham! and was immortalised in a 1985 song by The Damned. Wham! was part of the Power comics strand that also included Pow!, Smash, Fantastic and Terrific. As well as the traditional cartoon strips the comics also included the first UK reprints of Marvel stories, predating the first true UK Marvel titles that emerged in the early 1970s Mighty World of Marvel and Spider-Man Comics Weekly. Power comics printed many X-Men stories, although strangely the X-Men did not appear in the later UK Marvel titles. Although coming to an end in 1968 when it merged with Pow!, like many other discontinued weekly titles Wham! continued as a Christmas annual for several more years. Where the quality of some annuals can be dubious, the Wham! annuals are wonderful (I also have 1968). The majority of the strips are printed in colour, well worth the eight shillings and six pence price. The stories feel much fresher and more inventive than the better known Beano counterparts and those from the much longer lived Whizzer and Chips, Buster and Whoopee!. Other notable 1960s Christmas annuals I’m looking out for include the other Power comics titles, The Beano (my collection of Beano annuals only goes as far back as 1971) and any of the IPC Fleetway titles that included Lion and Valiant. Sadly, apart from Beano and Dandy still going strong, for Christmas 2016 comic annuals are largely no more. In fact some comics, such as 2000 AD, have continued to thrive with their weekly publication but have long ceased to produce an annual. These days annuals are largely a mixture of TV, film and pop tie ins. Incidentally, Christmas 1966 had Tom Jones at the top of the UK hit parade with Green, Green Grass of Home. Not particularly very Christmassy a song and the first time in four years that the Beatles hadn’t topped the charts at the end of December. Perhaps least remembered as a “Christmas song”? And at the same time television viewers were able to enjoy The Highlanders, Patrick Troughton’s second Doctor Who adventure. But with television being blamed as the major factor in the decline of British comics, including the Power titles, we won’t talk about that.